Playing by the loch on a sunny afternoon, the blacksmith's five children find a beautiful white horse and attempt to ride it, only to be nearly drowned. 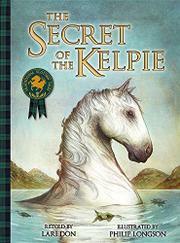 In this latest addition to a series of retellings of Scottish folk and fairy tales, the author uses elements of various traditional versions and acknowledges several collections of Scottish tales as source material. But Don makes her story far gentler than many. The youngest child, Flora, is the principal: the one who finds the beautiful white horse, figures out its true identity as a shape-shifting kelpie, and saves her siblings. No children die, and no fingers have to be cut off, only a piece of the creature’s mane. Sadly, though the story is told smoothly, with interesting language and plentiful dialogue, it never really comes to life. There are some Scottish words and usages: "Don't be daft," says Fergus when Flora refuses to get on the horse. But neither words nor images provide a strong sense of place. The illustrations, full of lines and swirls suggesting action, don't help to draw readers in. The characters are distant, even in close-up portrayals, looking down and away from readers. The colors are muted, just like the tale.